Dhamma Madrid offers weekly meditations in English and Español in Madrid. Our Sunday Sangha meets regularly at 19:30. Our next Sunday sangha will be April 28. This session features a 30-35 minute Vipassana style meditation, sangha or social time, a dharma talk and usually a 5-8 minute Metta or Loving Kindness meditation. In English with occasional Spanish and Pali. For more information click here. 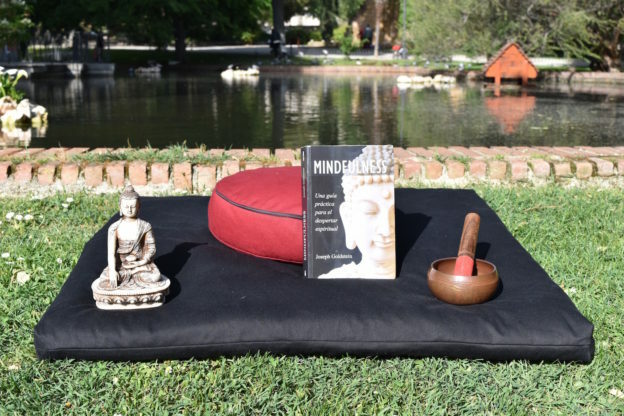 To RSVP, click here Madrid Meditation Meetup. Our next Spanish language Sangha will be Wednesday, May 1, 2019 starting at 20:00 pm. We normally meditate for 30 minutes, usually have a reading and finish with a Loving Kindness meditation. For more information click here . To RSVP, click here Madrid Meditation Meetup. Mindfulness Weekend in Cercedilla. 26-28 April. With Darran Kilbride. For more information, click here. 27-28 April. Urban Retreat with Bhante Boddidhama. In English with Spanish translation. In Madrid. For more information, click here. Besides Dhamma Madrid’s meditations, there are others meditations around Madrid. We try to list them on our calendar.